​Overdraft interest rates and fees are huge, and being in overdraft for an average of $2,000 a year can cost up to $500 in fees and charges. Bank overdraft charges differ massively - Kiwibank charges the lowest interest and fees (12.95%), BNZ charges the highest (23.70%) for arranged overdrafts. Look at switching banks to save money if you find yourself in overdraft. Worst still, banks are not transparent with the true cost of an overdraft - many add a "customer margin" to their overdraft interest rates; the lower the margin, the better you are as a customer and the less you pay, and vice versa. Avoiding 'unarranged' overdrafts will keep costs low, as will transferring savings into an overdrawn account. Knowing your bank balance at all times is key. Managing your money and making a budget is essential to keep overdraft fees to a minimum. If you find yourself struggling to keep up, your bank is obligated to help you under the Credit Contracts and Consumer Finance Act - talk to them before making matter worst. ​With overdraft interest rates as high as 27%(! ), an overdraft is, in no uncertain terms, a debt. It may not feel like a debt, but in every way it is. And like other debts, it needs to be managed and repaid. Our 10 step guide covers how an overdraft happens, what you will be charged, how to get your bank account in good health and switching to a bank account that leaves you better off. With the right planning and best bank account, saving $2,500 - $5,000+ over 10 years isn't a stretch of the imagination. ^ The greater of 0.12% of the overdraft limit and 0.12% of the highest daily overdrawn balance (minimum charge $2). Kiwibank offers the lowest overdraft interest rate of 12.90% p.a. and the lowest application fee, but to get it you'll need to have your salary credited to your account and have good credit. The ANZ charges the highest unarranged overdraft interest - an eye-watering 28.95% p.a. We have excluded the TSB, SBS and Heartland banks until their overdraft fees and interest rates are made clear on their respective websites. Note, we have assumed a $2,000 overdraft balance for all 365 days in a year - we understand this does not reflect typical account usage. 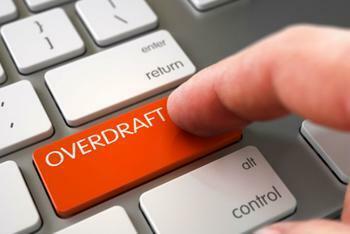 Overdrafts are fairly common among New Zealanders, and most people find themselves with an overdraft of between $1,000 and $4,000. Usually, the reason you go below $0 is due to “bad timing” - an automatic payment goes through when you already have a low balance, and to make sure it clears the bank lets you go into overdraft. Once you’re in overdraft, you will be notified and a charge applied and the interest calculated from the day your balance is negative. The higher your overdraft, the higher the interest cost you will pay. Overdrafts step in to avoid the issue of automatic payments and direct debits being declined, as that triggers a “dishonour fee” which can be as much as $40 per payment. Your bank will outline its overdraft policy clearly as to what it charges for using it – if it’s hard to find on their own website, Google the bank’s name and “overdraft fees and interest”. Remember, it’s not the bank’s fault if you don’t have enough money to cover a payment – making sure you have the funds is the aim of this guide. There is a big difference between the two when it comes to the interest rate you’ll pay. An “arranged” overdraft is a borrowing limit you’ve agreed with your bank – for example, it may be up to $2,000 if your bank account goes below $0. To have this overdraft, you’ll pay a one-off application or setup fee (fee 1), as well as an ongoing monthly “overdraft facility” or “service” fee, which starts at $10/month even if you don’t go into overdraft (fee 2). Finally, you’ll be charged interest as soon as your bank balance falls below $0 (fee 3). If you wish to change your overdraft limit, you’ll pay any other application fee (fee 4) regardless of whether the bank approves it. 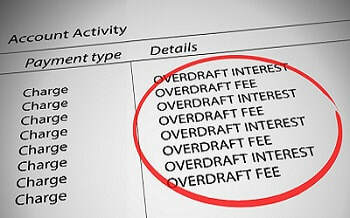 An “unarranged” overdraft is when you exceed your overdraft limit, i.e. go above a $2,000 agreed limit, and when this happens, you’ll pay a higher interest rate, known as the unarranged overdraft interest rate (fee 5). You may also be charged extra fees when you trigger an unarranged overdraft (fee 6), and together it makes expensive debt that can get out of control. Knowing what’s in your bank account lets you manage it and anticipate large transactions and shortages. Sign up to the apps and alerts and be in the know – unforeseen overdraft is less likely when you have up to date information about your bank account, and that gives you all the power to act quickly to make a change. With overdraft interest rates at 15%+ and after-tax cash deposit returns around 3%, you’re much better off using your savings to pay down an overdraft. Paying $2,000 into your bank account will save you about $300 in interest per year if you find yourself frequently overdrawn, and that’s before all the fee savings. If you need to reorganise your debts, look at balance transfer credit cards as a way of shuffling high-interest debt to 0%. If you know you’ll be in overdraft before payday, you might as well minimise the time you'll be in the red. If you get paid on the 30th of every month for example, move your direct debits to say the 28th or 29th so that you are in overdraft for as little time as possible. This only works if you budget and don’t spend the money on other things. Every bank has a duty to treat its customers fairly under the Credit Contracts and Consumer Finance Act. If you have a big overdraft and switching bank is not an option, call or email your bank and ask them to look at waiving fees and/or reducing the interest you are paying. If you’re barely able to keep up with the payments and feel yourself sinking, you can make a financial hardship application – see our debt help guide. If your bank does not help, look at free debt counselling from the Citizens Advice Bureau - full details can also be found on our debt help guide. Whenever you get paid, don’t let your money sit there as you then risk spending it on things you don’t need. Instead, consider opening up a basic free bank account for day to day use, transfer a small amount for your needs, and repay your overdraft like it’s a loan or credit card. Prioritise paying your essentials (mortgage or rent, electrical etc) and then other high-interest debt, such as credit cards and store cards. “If you don’t need or, don’t buy it” is a simple tip which always helps you to get back on your feet. Once you’ve repaid your most expensive debt, you can move on to the next one. Read our Debt Guide for more tips. Debt is best controlled and repaid when you are aware of exactly what you owe and to who. If you don’t open your mail and delete emails from lenders without reading them, stop doing that. You want to be aware of your financial position at all times, even if it’s not looking that great and raises anxiety levels. Awareness is the only way to improve your situation. Banks love to charge fees and penalties, so fight back by being in control of what’s going on. If you are really struggling, see our debt help guide. A basic bank account is a no-frills, no-overdraft current account that is low in fees and benefits. You will still need to be approved and credit checked, but if you’ve got no need for an overdraft it’s probably best to switch to a more suitable product. Talk to your bank about their overdraft-free accounts. The average arranged overdraft interest rate is 20% p.a. and you’re paying monthly fees on top, making the repayments as expensive as credit card debt. The interest is calculated daily, and applied to your balance meaning you can get trapped in a debt spiral. We believe high-interest overdrafts and their endless fees are, sadly, here to stay for the long term.